Hi everyone! 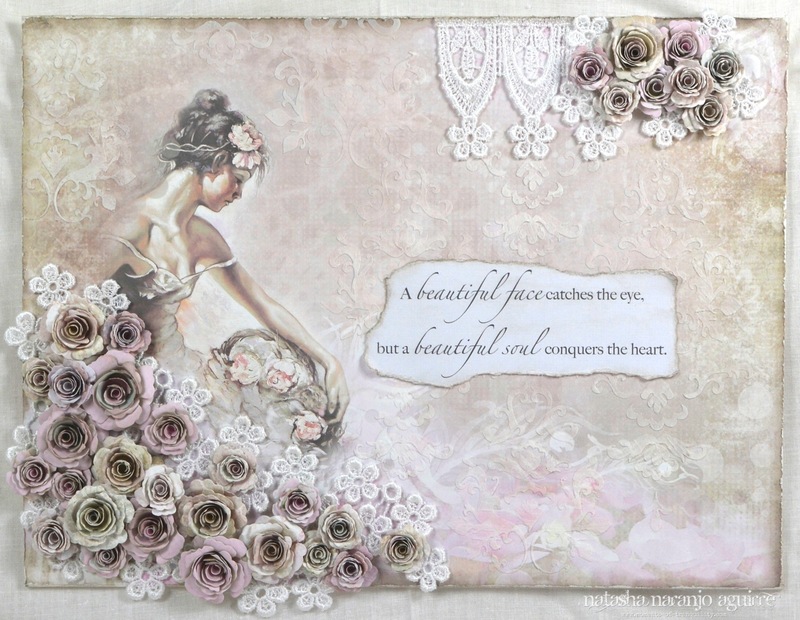 This is a canvas I made as a Guest Designer for C'est Magnifique using their September kit! This kit includes a variety of papers by Kaisercraft and Scrapberry's. Included in this month's kit is a stunning piece of lace that I cut apart and added to the cluster of hand-made roses. To add texture to the background of my canvas, I used a damask stencil and texture medium. If you would like to purchase this amazing kit, please visit C'est Magnifique! Absolutely beautiful, from the awesome flower sprays to the inspirational sentiment. This canvas is stunning, Natasha! Girl STUNNING work!!!!!!!!! Oh my is all I can say. Stunning work, you have totally out done yourself with this canvas! I will be ordering this kit and giving it my best to copy. Thank you for providing your audience with inspiring ideas, your the best!